Datasette lets you deploy an instant web UI and JSON API for any SQLite database. csvs-to-sqlite makes it easy to create a SQLite database out of any collection of CSV files. Datasette Publish is a web app that can run these combined tools against CSV files you upload from your browser. And now the new Datasette Facets feature lets you explore any CSV file using faceted navigation with a couple of clicks. Let’s use facets to explore every character in the Marvel Universe. FiveThirtyEight have published a CSV file of 16,376 characters from Marvel comics, scraped from Wikia as part of the research for their 2014 story Comic Books Are Still Made By Men, For Men And About Men. We start by applying the identity status, alignment and gender facets. Then we filter down to just the bad characters with a public identity, and apply the eye colour facet. Now we can filter to just the 20 bad characters with a public identity and yellow eyes. At each stage along the way we could see numerical summaries of the other facets. That’s a pretty sophisticated piece of analysis we’ve been able to run with just a few clicks (and it works responsively on mobile as well). I’ve published a full copy of everything else in the FiveThirtyEight data repository, which means you can find plenty more examples of facets in action at https://fivethirtyeight.datasettes.com/—one example: Actions under the Antiquities Act, faceted by states, pres_or_congress, action and current_agency. The US government’s General Services Administration have a GitHub account, and they use it to publish a repository of assorted data as CSVs. Let’s take one of those CSVS and analyze it with Datasette Facets, using the Datasette Publish web app to upload and process the CSV. Here’s the result, with the Status and Deployment Type facets applied. And here’s a query showing just SaaS tools with status Approved—Preferred. This will start Datasette running at http://127.0.0.1:8001/ ready for you to explore the data. 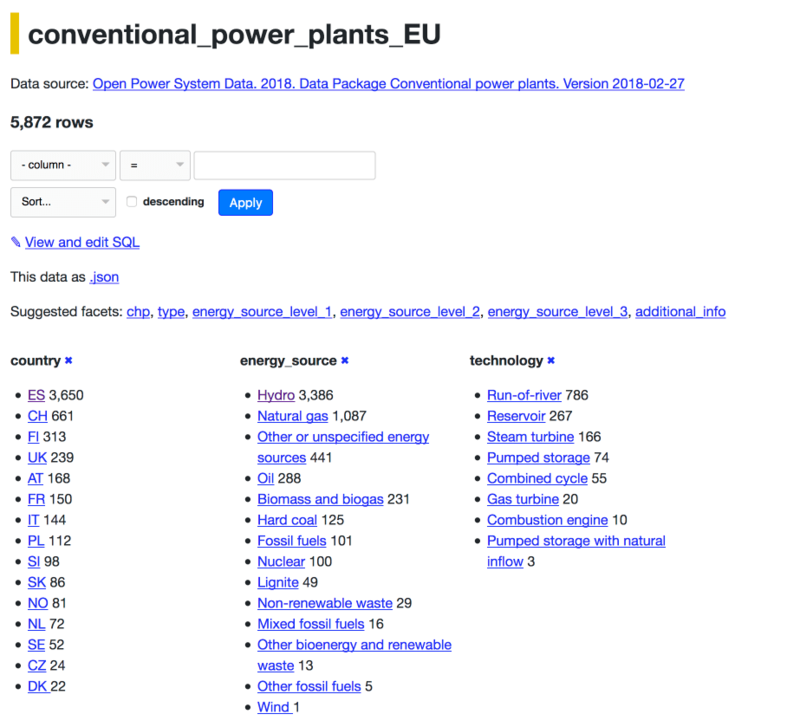 Here’s every conventional power plant in Europe faceted by country, energy source and technology. I love faceted search engines. One of my first approaches to understanding any new large dataset has long been to throw it into a faceted search engine and see what comes out. In the past I’ve built them using Solr, Elasticsearch, PostgreSQL and even Whoosh. I guess it was inevitable that I’d try to build one with SQLite. You can follow the development of Datasette Facets in the now-closed issue #255 on GitHub. For large tables, this could get expensive. Datasette supports time limits for SQLite queries, and facets are given up to 200ms (by default, this limit can be customized) to finish executing. If the query doesn’t complete in the given time the user sees a warning that the facet could not be displayed. We ask for 31 values in the limit clause even though we only display 30. This lets us detect if there are more values available and show a ... indicator to let the user know that the facets were truncated. All we are doing here is trying to determine if the column in question has less than 30 unique values. The limit clause here means that if you run this query against a column with entirely distinct values (the primary key for example) the query will terminate extremely quickly—after it has found just the first 31 values. If the query takes longer than 50ms we terminate it and do not suggest that column as a potential facet. Please let me know if you build something interesting with Datasette Facets! This is Datasette Facets by Simon Willison, posted on 20th May 2018.